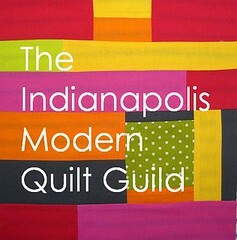 This evening I'm headed to an overnight quilting retreat with members of the Indy Modern Quilt Guild, and I'm so looking forward to it. If you don't see the fun in this sort of thing, well, clearly you're missing some crafty DNA or something. I plan to start piecing a new baby quilt (commissioned by a friend) and work on a block tutorial that I've been asked to lead at the next IMQG meeting. Of course this will all be accomplished amidst good company, good food, a few games, and the whirr of sewing machines. I've heard rumors that cupcakes and Sangria will also be involved...now are you jealous?